Following on from Vol. 1, Vol. 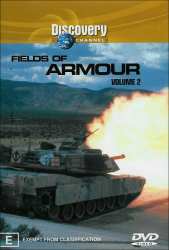 2 covers the continuation of the history of armoured warfare. Once again the disc in broken into six segments that can be watched as a whole or by topic. As I mentioned in my review for Volume 1, I believe that this series could be used as a fantastic learning tool in schools teaching history, as even though the emphasis is on the armoured combat topic, there is also enough to keep you interested overall. Chronologically divided, this DVD starts with the war in Korea in the 1950's when the North invaded rolled their tanks into South Korea that was supported by China and the effects of launching such an invasion. It wraps up with the war in Iraq in 1991. Footage on this disc is sensational to say the very least and will take you directly into the heart of the horror that is war. It would be prudent of me to mention that there are some disturbing images shown throughout the series that are not shown for gratuity, rather as a matter of fact way of illustrating that this is war and this is what it does. The series uses photos, movie footage and information gleaned directly from the diaries of both fallen and living servicemen. We get impressions from the men themselves and the opinions and observations of respected historians on the subject. The disc contains no extras other than Scene Selections for each chapter and is certainly a DVD that I recommend as riveting viewing being interested in the subject matter. I believe that anyone who viewed this series would be the better for it.